Well… I had a full episode 4 write-up all prepared, it needed editing/reformatting, images and optimization. It was going to be late, I’m a one man shop and I have three shows and lots of games to write about. However the draft seems to have gone missing completely. So I guess no full recap for that episode. I’ll go over some major points with the help of the included brief recap from the show. 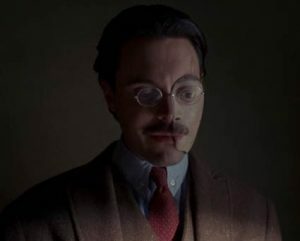 Episode 3 A Dangerous Maid saw the full-on war begin between Nucky and the Commodor/Jimmy and a glimpse into Margaret’s past. We open with Nucky’s speech for Memorial Day where he makes a play at Jimmy, attempting to make him look bad by inviting him up to speak. Jimmy ends up handling it fairly well. At this same time Harrow, a veteran himself, declines to be there. Instead he thumbs through his scrapbook of ideal scenes, stopping on the drawing of himself done by Angie next to an photo of how he looked before his injury. He’s packing up and heading somewhere. Nucky shmoozes with the Attorney General and his people, while Jimmy tries to do the same with the commodores people. He says he speaks for the man and tries to lead. He gets smacked in the head with a cane by a man who made a fortune off of war-profiteering and slaughtering Indians. Jimmy takes his leave with Eli, thoroughly breaking down by this point, following after and trying to stop him. Harrow is out in the woods. He appears to be taking in the sounds and sights of nature. He removes his face mask and lays back. Harrow is going to kill himself. NO! One of my favorite characters. He is interrupted by a dog who steals his mask. Richard is forced to give chase. In the mean time, Nucky returns home to find Margaret disturbed by a guest, his brother Eli. Eli is attempting to get back into Nucky’s good graces. He works up the tears, says he’s made a mistake, etc. 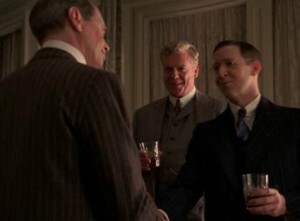 Nucky appears to accept, until he tells Eli to get on his knees and kiss his feet. A brawl between the brothers ensues. Punching, choking, general chaos, interrupted only by Margaret pulling a gun on Eli. So, how does Eli handle the fact that he is completely screwed? He gets completely drunk. But that’s not enough, he drunkenly bludgeons, I think it’s George Baxter?, to death with a giant wrench. An accident at first he then finalizes his crime with a graphically depicted head smashing. Yuck. 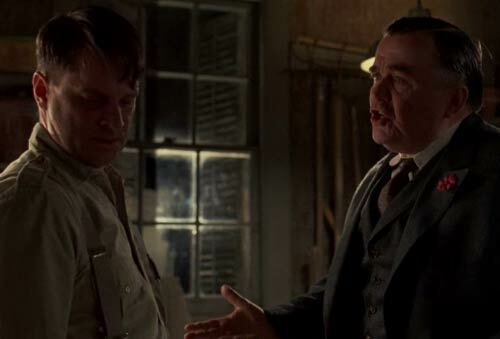 You see, poor George was gonna jump ship back to Nucky. Harrow meets up with hunters and bootleggers, who have the dog and the mask. They are kind and fairly gently let Richard know they know what he was there to do. “These woods are for living”, not for dying is the gist of it. Harrow gets the message. After returning he asks if Jimmy would fight for him, the response is, “to the last bullet”. With that they head to a job which is payback on the old man war-profiteer. He gets some Native American justice via a scalping at Richard and Jimmy’s hands… Ouch! Nucky is really pissed off, eh? Trouble can only grow where this show is headed.